I’ll come out and say it: I haven’t tried a lot of the different versions of cgminer. I’ve always been a proponent of ‘latest and greatest’, so I’m using cgminer 3.7.2 – the last build to support Scrypt-based mining (all cgminer versions later than 3.7.2 will not work for Litecoin/Scrypt-based coins). Go ahead and download 3.7.2 now. GPU-Z: This utility will allow you to monitor everything that is giong on with your graphic cards. You’ll be able to see your clock speeds, engine speeds, voltage and temperatures plus a lot more. HWMonitor: There’s a lot of hardware monitors out there, but I like the simplistic approach HWmonitor takes. No fluff, just information. As far as brand goes, I’ve always preferred the following (in order of coler reliability and warranty/RMA replacement): Sapphire, ASUS, Gigabyte, MSI, Powercolor, XFX. I’ve had no experience with HIS or VisionTek. While you can mine solo, your best bet on steady income directly related to your hashing power is to join a mining pool. You can see a comparison of different mining pools here. Personally, I recommend using WeMineLTC because of their large hashing power, you’ll always be finding fresh blocks reducing your stales. They also have multiple servers that you can add as failovers (backups for when one server goes down). Regardless of the pool you choose, you’ll need to create an account. From this account you’ll create (at least) a worker; this worker will include a username and password – usually a variation like [username]. [number] and a password of x or 123, etc. These credentials do not need to be secure – if someone wants to mine for you – let them! You should NEVER make these credentials the same as your main account. Think of them as ‘open to the public’. The black magic of mining is your cgminer configuration; it can be the difference between a 300mh/s hash rate and a 600mh/s hash rate. Worst yet, the tweak may be a single configuration flag (or even a poorly optimized flag). 1) You’ve downloaded cgminer 3.7.2 as mentioned above. 2) You’ve put the cgminer folder somewhere convenient for you; I keep mine on my desktop. 3) You’re using Windows (and at least Win7). If you’re using Linux, the following configuration flags may still be useful. 4) You have a basic understanding of how to use and create .bat files. If not, a quick google search should help. 5) You have created a mining pool account, created a worker, and have that worker username and password ready for use. First up, make sure cgminer has enough CPU priority that you won’t be reducing your hash rate before you even get started. Some programs will keep your CPU in a high usage state and this can really affect your hash rates. Things like LogMeIn Pro, Dropbox and even Microsoft Security Essentials are notorious for dropping your hash. You might want to disable them while trying to tweak your cgminer settings. Next, there’s two main ways to configure your cgminer – from the command line and from a conf file. They both provide the same ability, it’s really just whatever you prefer. For the purpose of this article, I’ll be using .bat files because they are easier to share. You can easily apply the same values to a conf file. Hopefully this will help get you off and running. If you have any questions, feel free to email me or join the WeMineLTC IRC channel and ask for help. And when you earn that first LTC, consider throwing a bit of it to LWiPotJYnAEgjXFu8VCvPNj3yjspEimETD for helping out! In future posts we will discuss optimizing your earning potential by adding CPU mining to your mining so you are taking full advantage of your mining operation. Hello! I have two systems and trying to get them running CGminer correctly. How can i do a “config” for all difrent GPU’s when im usin only one CGminer each system? If some one can help me get started correctly I will give you 0.5LTC when i start minning them. Lars jays112@hotmail.com write subject help CGminer gpu config. You can specify different values for each card for each element in your bat file. OMG! you just increased each of my cards output by 100GH/s!! Just fyi… the 290x configuration gave me the blue screen of death on Windows 8. Great thanks for the input! It seems every card is different. I’ve had two identical cards benefits from wildly different settings. Hey great guide. Can you explain to me what the failover url is? A lot of times the mining pool you are in will go down for whatever reason (maintenance, DDoS’d, etc). A failover allows cgminer to continue mining (ie. making you money) by simply saying ‘oh, this server is down, I’ll use this other one’. hi guys. im kinda new to all this. I have sapphire radeon 7970 and max i get out is 510khash. Im runing guiminer and it works ok.
You should try running the bat from a command line first. Then put the full path to the bat file so you can watch the response before it closes. I noticed your response to Lars above about changing gpu engine for each specific card. I’m using 2x Sapphire R9 290’s which came with “AMD Catalyst Control Center” to alter the settings, Overclock, etc… If I’m using the CCC system to adjust my card(s) settings, can I leave that portion of the code out of the .bat file? Also, I’m unfamiliar with “verbose” – how will that change my current settings? I’d recommend setting them with CGMiner as you can then use the Interactive menus to step up/down each setting to find the actual best value for your specific cards. Even the same card and maker can often have widely different values. The setx variables are for your local hardware; the sync_objects variable may not be needed for your specific system, but it’s often recommended as a starting point. Email me if you’d like additional help, happy to try. Thanks for the guide, but I am only getting about 400kh/s to 420kh/s per 7970. I am running 2 of them. sorry I made a mistake when I copied over my batch file to my previous post. Try removing the gpu-engine settings as they may be too agressive for your card. Also try first setting memclock to 1250. See if that increases or decreases performance. What if you increase intensity (-I)? I got a feeling that this mostly affects the hash rate. What is the make of your cards? Luc, are you by chance running anything in the background that could be slowing things down? See if anything is causing your CPU to run at a high load. Try closing down any and all programs other than cgminer; try to get it down to a barebones list. I’ve often lost a lot of hashing power to things running in the background. Thanks Ryan for your help… My system is running clean, CPU usage is 0% to 5% when doing normal stuff like browsing internet…I am running Windows 8.1 Pro not sure if that’s an issue or not. I will stop MSI Afterburner and the RivaTunerStatisticsServer and see if that helps at all. See if this changes your output. I have removed the –thread-concurrency 8192 and that made it a lot worse. The 1st GPU is running at about 50kh/s and the 2nd GPU is running at about 250kh/s. If I add -shaders 2048 cgminer does not start it gives me an error message. here is my batch file now is this the way you are suggesting it to be? with the command line that you provided both GPU’s are running at about 420kh/s for a grand total of 830kh/s 🙁 temps look good at 77 and 84 and my fan speeds are at 45% and 52% respectively. How to set the fan to auto adjust my temp? ex I want it to run at 54% at 94 degree, 53% at 93 degree, 52% at 92 degree? when i use auto fan with temp target 94 it goes over 54% and it’s too loud, I placed my computer next to the window and it’s -1 degree outside, so i’m pretty sure 54% or less fan speed is enough, however I want to slow the fan speed according to the gpu temp so my gpu fan won’t be staying at 54% all the time. I also tried –fan-speed 45-54 but it goes strait to 54% and never comes down even my gpu isn’t at 94 degrees. Yeah, I’ve never had much luck with the fan ranges. Are you trying to mine in a closed box? What hardware are you running? no, I just keep chang the .bat file and trying to find out what works. Have you tried removing the thread concurrency and setting shaders to 2048 instead? Did you ever get your hashrate up? I have a Gigabyte 270X and a PowerColor 270X, both hashing at 470+ KH/s. I just picked up the Asus R9270X-DC2T-2GD5 and can barely hit 410 KH/s. I have tried all the posted configurations and TC of 21568 is the best I’ve found. Your settings gave me 100Kh/s extras on a 7970! Hey Dustin! Looks like you’re providing a lot of awesome tips here! Your template after a few tweaks provided a great baseline for me to tune my rig! I just had a quick question though. In reference to the code, –text-only is just my display preference, thread concurrency is set to the max that will run (tested by increasing in intervals of 2048), I get meager results and a ton of ‘HW’ errors upon trying ‘-g 2’ so that seems pretty dead set in place, and the temp targets are to my liking, as I have the rig in my room and trying to limit heat/noice. Maybe you could help me out if you feel altering engine/mem clock, powertune, worksize, or adding in –gpu-lookup may help me in any way? Can you give me an idea of what your default settings are? (Either from GPU-Z or afterburner). Have you also tried with just one device to rule out bad components (underperforming PSU, etc). Default settings are actually on Catalyst Control Center, which unfortunately doesn’t tell me as much as MSI Afterburner from what I understand. Should I utilize that instead? Defaults are just set to level 0’s all across the board, but upon entering in my code, it changes the view in CCC to represent the OC settings. When I run just 1 GPU, I can run it all the way at 19 or 20 intensity. If the PSU is indeed the problem, that might be a more extended fix as I’ll be away on business this week and don’t have time to head to the local computer store and get another / install immediately :/ Do you think undervolting or adjusting the GPU’s eng or mem clock speed could help alleviate some of the electrical draw? Also, I believe my GPU’s are running at 1.81v – I don’t know whether that’s a piece or per GPU, I just remember seeing it as the standard default selection in my BIOS prior to installing windows. This is all assuming that the PSU in the problem. If you feel there may be something else awry, feel free to chime in 🙂 I remember seeing a post that said gpu-lookup may be an important factor? Sounds like I may just need to do some experimenting later tonight. Try launching the .bat file from a cmd prompt to make sure it’s not exiting on a syntax issue first. Hi, I wondering how the intensity can be such low (13) to get 700 above? It is impossible for me, until I increase it to 20. I just picked up a few Gigabyte 270x (GV-R927XOC-2GD) but don’t understand how you and others are getting any thread concurrency above 8192. I’ve only spent a couple hours tweaking but have not been able to reach above 350kh using 1 thread and 380kh using 2 threads. Any thread concurrency above 8192 will give me the “reduce TC or lower LG” error, any intensity above 13 will give me tons of HW, temperatures are good. #18 I’ve also had (3) XFX 7950 (TDKC) with the same limitations but with extreme temperatures (85-105C no matter the settings). Have tried both cards on 3 different systems to factor out any other limiting hardware. And I get around 360 Kh/s. When I increase intensity up to 19, I get around 450 Kh/s, but the card gets hot and I will leave that option until I get a better case. Question regarding bat file, how do I add one more pool to the –failover-only . I would like to have 2 –failover-only pool . Do I just need to add one more time –failover-only -o stratum+tcp://[failover_url] -u [workerusername] -p [workerpassword] at the end of the bat file ? Very good job thank you for this great blog . I’ve only got one failover in my bat file, never tried more and not sure if it’s possible or not. When I need more, I usually switch to a .conf file since you can have as many as you want without much problem. You can always load your .conf file from a .bat file with -c flag. nvm finally broke the barriers, 270x @ 485-490kh. Great! Were you able to keep your temps down? I’ve had some trouble keeping my 270x in the same range as my 280x. I don’t have my risers yet, but GPU0 is @ 55C (never exceeds 60), GPU1 and 2 (finger width between each other) are @ 74C with fan @ 65%. Once the risers arrive, I’m pretty confident all cards will be 65C max if not 60C. I have two XFX 290X’s and I can’t get it to cgmine with Win. 7. I used 3.7.2, but no dice. Is there a particular configuration for these cards or particular command? I know they don’t mine with 3.5. Can someone tell me EXACTLY what to do if you know? I would GREATLY appreciate it. Are you getting errors or they simply don’t load cgminer? Great to hear. I’ve only heard XFX runs slightly hotter than others. i use 2 x Radeon R9 290 Cards. i become 500 – 550 Kh/s on one card. have you a idea that i can have on a card 750 – 900 Kh/s? It appears you don’t have any settings in your configuration. Can you post your entire .bat file? I have 2x MSI R7970 TF 3GD5/OC BE, Win7, drivers: 13-12_win7_win8_64_dd_ccc_whql.exe and. cgminer 3.7.2. What is it? Thank you. First guess is something running in the background (ie. virus software, ATI drivers [MOM.exe / CCC.exe], etc). Next guess would be your PSU isnt strong enough to power both fully at load. Can you try running each card individually to see if you get the same speeds on both? I’d then check into what you’re running in the background and then if that doesnt help, look at your PSU load. I used your settings for my 3 r9 280x. And getting some good kHz. But! My problem is my motherboard is very tight. So I was wondering, if i can set my g0 to max as it is, and the other 2 a bit lower, so i can keep em cool. They are running on 94 and 99 degrees. You might also want to look into powered risers for your cards to help spread them out and prolong the life of them! trying to start mining on new asus 290x already 2 days. CGminer 3.7.2 and a lot of different configs, 2 different pools… The same thing everywhere. Can’t even suppose what is wrong. Can you give me piece of advice? Which coin are you trying to mine? Make sure you have no-stale set in your configs as well if its a newer / smaller hash coin. Great post. I’m new at configuring computers so I went for the easy route. I downloaded GUIMiner. I set thread concurrency to 24500, W-256 and I-20. I’m only getting about 720 Kh/s on one card and about 840 Kh/s on the other. Its the same with crossfire on or off. I know I can get 1000 Kh/s per card because of my setup. You’ll want to make sure your PSU isnt the problem – a lot of times a PSU is rated at a certain output, but at high usage (which mining will do) your throughput will drop so you’re performance will as well. You’ll also want to make sure nothing is interrupting your performance such as virus software, ATI control panel (CCC.exe / MOM.exe), or anything that is graphic / cpu intensive. I have 2 x R9 270 Gigabyte Windforce cards installed on an BAMT SMOS system. After initial bootup the cards provide a hashrate of more than 1000Kh/s but this only lasts for a couple of minutes then it drops to 450. After this it fluctuates up and down but never goes much over 700. Eventually after a few hours both cards stop working altogether. Please could someone indicate which lines in the cgminer.conf have the greatest impact on stability and are most likely worth changing? Also, how do I calculate the best thread-concurrency value? I have seem so many alternatives and have no idea which one to go for. Lastly, if I do change the concurrency value, is there any other config I should chnage in parallel? Initially I’d guess PSU throughput if its tailing off while mining; what is your PSU and how is it rated (gold/plat/etc) ? Dropping your intensity (-I) setting is your ‘volume knob’ of sorts – it will lower everything as a starting point. Use that as your starting point. Anyway I try I get about 370Kh. I am using cgminer 3.7.2. Try stepping down your gpu-engine setting in increments of 20 and let it balance for a few minutes and keep a ledger while doing this; repeat until you find the sweet spot. Also, you shouldnt need both shaders and thread concurrency defined, as they will cancel each other out. 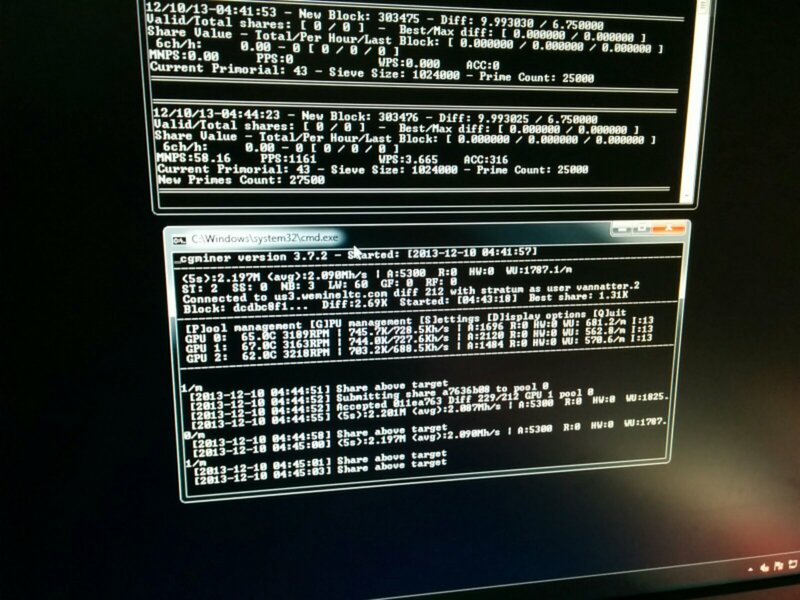 496Kh/s first four cards and 477Kh/s last card. But how can I reduce the rejects? Help, please! Thanks! Make sure you have no-stale submit in your configs as well; are you getting HW errors or just rejected? If it’s just rejected, use the no-stale and maybe try a different pool to see if it differs. I use win7Ult and 3x asus radeon R9 290x. the problem is that I only got 14kh/s from each card. I hope you’ve figured this out – I’d first recommend checking your PSU throughput and maybe seeing how things run with just one or two of your cards running. You may be saturating your PSU as those 290x’s can use a lot of juice while running at load. I’m writing from Italy. You do a wonderful thing to help other users. I have a system with 3 video cards Sapphire HD 7970 Vapor-X GHZ Edition SKU: 11197-12 -40G , 3 GB GDDR5 MSI 890FXA – GD70 motherboard with 6 PCI Express slots , power supply EVGA 1300 Supernova G2 , 6 GB RAM ( I seems little – maybe we need at least 3 times the memories of GPU). Almost a month I tried all gminer with various settings but the system does not rise over 1600 khash / s ( maximum 550 khash / s per card). I also performed step-by- step the settings of the founder of cgminer (also in the readme file of the application itself), I applied the tutorial to dig dogecoin , I read so much and so I came to you. My hope is you 🙂 . I make a nice donation if you can help me get at least the default parameters for these cards . For more details and photos can I write directly to your email. I also accept direct control with TeamViewer. I await your kind reply . Thank you very much . Contact me directly if you are still having trouble, happy to help. I made a new rig with 3 -r9 280x sapphire , seasonic 1200 w PSU , 16 gb ram , asus sabertooth 990fx , AMD Fx8350 CPU.. What i want to do i want to use 2 cards just for mining and main card for my daily uses is this possible ? Anyone please guide me and help me to set up .. I also accept direct control with TeamViewer. I await your kind reply . Thank you very much .